Who likes climbing hills? The fight against gravity can leave your legs screaming in pain, your chest burning in agony and your head desperately craving oxygen. Yet there's a great feeling of achievement after taking on a murderous climb and winning. You may not enjoy it at the time, but that feeling always brings you back for more. 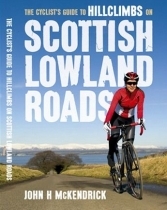 In this guide, John McKendrick brings together 36 of Southern Scotland's best hillclimbs, including such cycling club favourites as The Nick o' the Balloch, The Crow Road, The Duke's Pass and The Serpentine, as well as many less-known but equally exhilarating and testing climbs - stretching from Glasgow and Ayrshire to Galloway, the Borders, Edinburgh and the Central Lowlands.